Why is there no good Thanksgiving music? Simple Gifts? Turkey in the Straw? George Winston? Maybe. Adam Sandler, you’re great and all, but that’s a terrible Thanksgiving Song. Sorry. I thought it would be a good idea to create the ultimate Thanksgiving playlist this year. I scoured my own library as well as Spotify and iTunes, polled a few friends, and have come up dissatisfied with the offerings. Here’s why: most collections of “Thanksgiving Music” are really just collections of music that would create a decent background for a group of widely varied individuals. Lowest common denominator Muzak, but not really about gratitude. Gratitude can be directed at a person or can be for a thing. If directed at a person in song, it is usually either praising God or a lover. People are grateful for love- true love- and that has basically two sources. Thank you, Lord, for loving me despite everything I do wrong. Or, alternatively, Thank you, great person, for trying to love me despite everything we both do wrong- this category is not for songs about love, but for songs specifically about gratitude for the way another person loves. If gratitude for a thing is put to music, it is usually more about the thing than one’s gratitude; I love my family, my home, my city, my country, nature, life, my significant other (that last one accounts for about 97% of all positive popular music). The gratitude is implied. 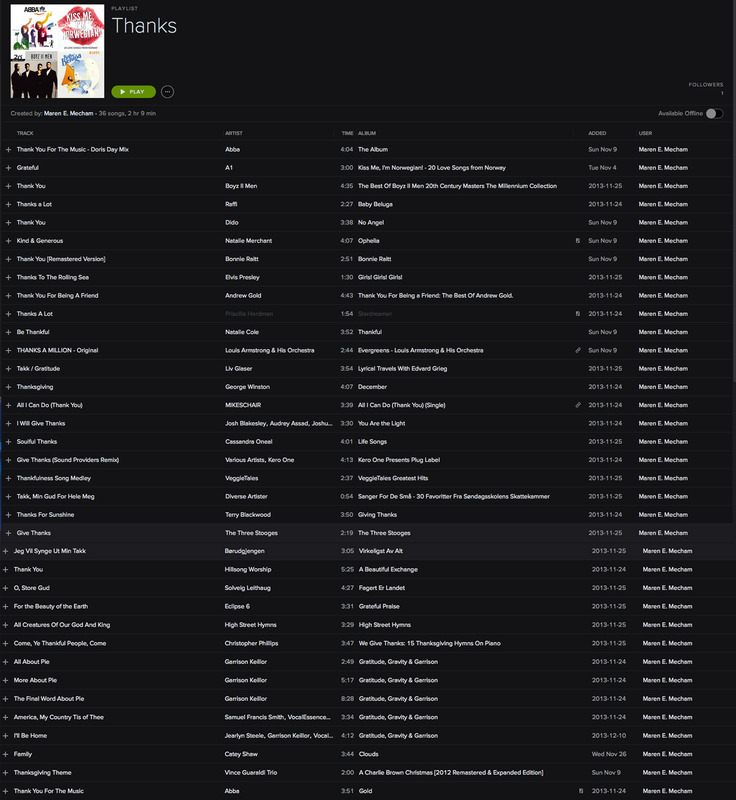 Ok, so I managed to scrounge together a playlist, but it is really, really disjointed- even for my weird musical tastes. Here’s what I have. It’s on Spotify and if you have more ideas, please share them! Secular gratitude. Six songs fit nicely into this little category. Some folks are just grateful without acknowledging a source. Agnetha, Benny, Björn, and Anni-Frid like music and golden hair. Dido likes the way her significant other is sensitive and makes her day great. Boyz II Men had an exceptionally caring person in their past. Elvis likes fish. Andrew Gold likes having a great friend. Raffi (and Pricilla Herman does my favorite version) is grateful for everything. Try these on for size. There are a few instrumental songs regarding thankfulness, but you will have to overlay your own emotions on those in order to feel specifically grateful while listening to piano performances by Liv Glaser and George Winston. When we white folk get to praising, sometimes it can be a little like too much white chocolate: cloyingly sweet. I included some of that, too, because most days I have a high tolerance for innocent sweetness even though I don’t like white chocolate. We have a selection from Veggie Tales, Terry Blackwood, and the Three Stooges (just missing something by Donny Osmond here.) The epitome of this category is a Norwegian song called “Jeg Vil Synge Ut Min Takk” (I Want to Sing Out My Thanks) which is a perfect junction of praise, 80’s pop, innocence/naiveté, Scandinavian-ness (can I just say “scandinivity”? ), and gratitude. So very me. That one gets me dancing and I don’t expect anyone else- even in my immediate family- to understand. Beyond that, we have hymns, which are always nice and bring a sense of peace to expressions of gratitude. I have three or four of those on the list but wish we had more good ones. The Children’s Songbook of the Church of Jesus Christ of Lattter-day Saints has some very good ones, but they have not been widely produced on the web. He clearly meant for us to gather to pray and give our thanks to God. But today we are so independent that we disregard even this basic guideline. We have not candified Thanksgiving, thank goodness, but we have commercialized it with an over-the-top parade, football games, and a day of insane purchasing. Has anyone noticed what Thanksgiving has become? Garrison Keillor has a magical way of weaving words which sound like home to people of all backgrounds. My playlist is rounded out by his three ruminations on pie, family, ourselves, and Thanksgiving in general. Finally is his wacky version of “America, My Country Tis of Thee” which I love because it tells a tiny story of America while flaunting the first amendment by tweaking a beloved patriotic religious song. What could be more American? It’s as American as pumpkin pie. So no matter what you eat or with whom you spend the holiday or who you (do or don’t) worship, I hope this for your Thanksgiving: may you have music that warms your heart and assists in your effort to be grateful for what you have. Because it is a lot. This entry was posted in Autumn, Holidays, Life, Politics, Religion and tagged American, family, gratitude, holiday, music, religion, thanksgiving, tunes by Maren. Bookmark the permalink. I would add “All Together Now,” (Beatles, right? There’s also a Muppets version) because the gathering together is the important part for me. I love what you have written here, Maren. I too have mourned the lack of Thanksgiving music, and in the past I have tried to make up for it by listening to Christmas music in November – but looking over your list I feel encouraged to try really listening to Thanksgiving music – and enjoying the happiness that comes from more “living with gratitude” in my consciousness. Thank you. Hope yours was a blessed and happy Thanksgiving! It was. Thank you, Michelle. Best wishes for a wonderful holiday for your family!